Last Saturday, I was receiving some friends at my place, and, as a real sugar addict, it was THE opportunity to make a good dessert. With the beginning of spring, I really wanted to make something fresh, with fruits. I had already tested this recipe and it was a real success ! The original recipe indicated to use raspberries and pomegranate as a garnish, but you can really adapt it and use the fruits that you want. I chose to use strawberries! This recipe can be quite impressive (a lot of steps) but don’t be afraid! - Out of heat, mix the sugar, the cornstarch and the flour. - Add the eggs and vanilla extract and mix well. Add the milk to the mixture. - Bring to boil, stirring constantly to prevent a deposit to be created at the bottom of the pan and burn. - Once the mixture thickens, remove from heat and add the white chocolate and stir until the chocolate is completely melted, then add the yoghurt. - Pour into a bowl and place it in the refrigerator for at least 3 hours. PS: To prevent the cream to harden on the top, put a plastic wrap directly on the custard. Whip the cream with the sugar and the vanilla extract until the mixture is firm enough to return the dishes without it falls. - Roll out the dough and cut rectangles the size you want depending on the number of portions that you want. 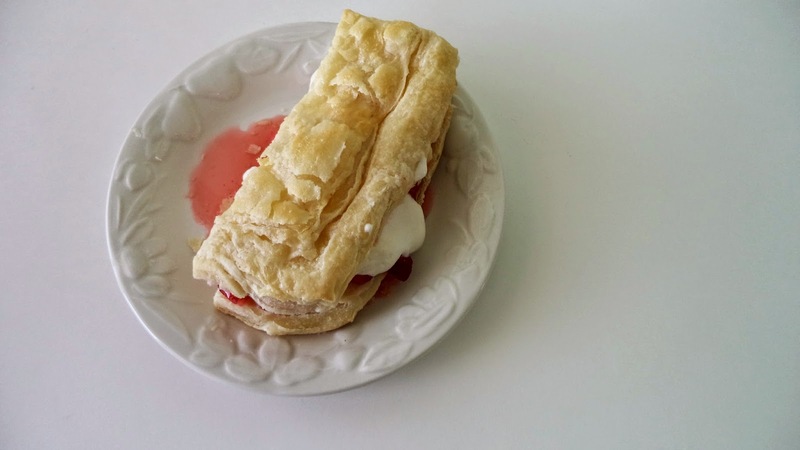 - Brush the pastry with the cream and sprinkle with the sugar. - Cook for about 20 minutes, until the pastry is golden. Then let it cool completely. 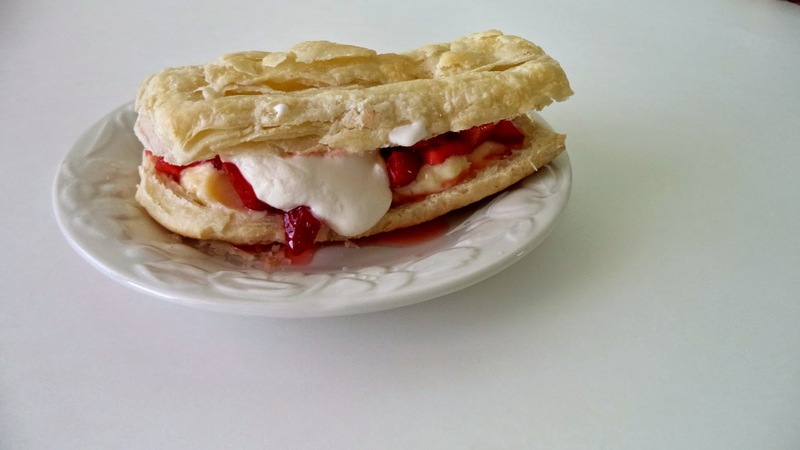 - Cut the pastry in half lengthwise and add the pastry cream, strawberries and whipped cream on the bottom half. - Cover with the top half. 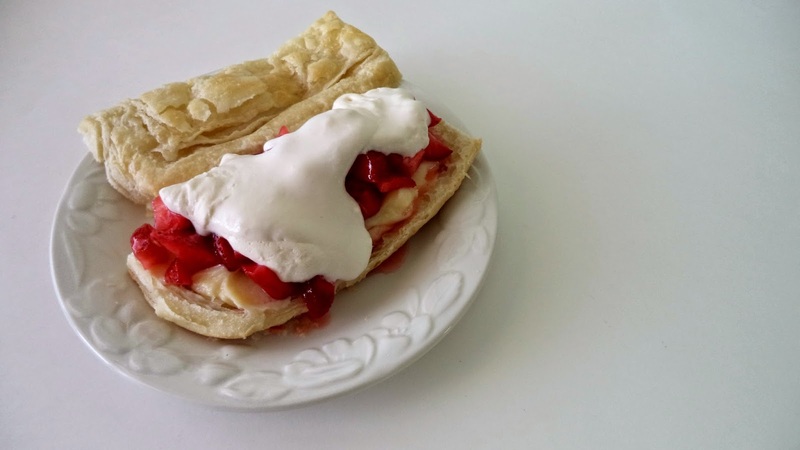 PS: If you need more sugar, read this fruit tarts recipe and this cookies recipe!